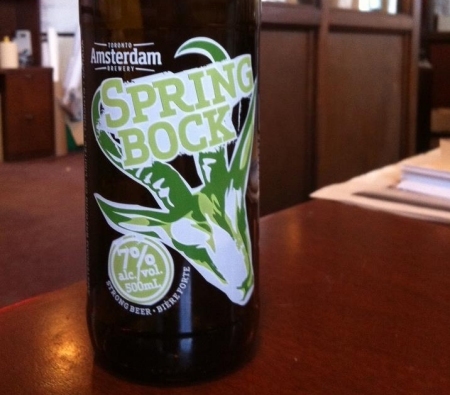 TORONTO, ON – Amsterdam Brewery has announced the impending return of the seasonal Amsterdam Spring Bock. Our Spring Bock is crafted using three types of imported malts to give it a unique richness and deep mahogany colour. Fermented with our house strain of Danish yeast and aged three times longer than other beers, Amsterdam Spring Bock is a seasonal brew you do not want to miss out on. This year’s edition of Amsterdam Spring Bock will be officially launched at a “Rock Out With Your Bock Out” party at the brewery (21 Bathurst St., Toronto) on Wednesday February 22nd from 5:30 PM to 8:30 PM, featuring samples of the beer, food from Grindhouse Burger Bar, and special aged kegs of the 2010 and 2011 editions. It will soon be available in 500 ml bottles at the Amsterdam retail store and select LCBO outlets, and on tap at several bars and restaurants in Toronto and area.